= Yakusoku ne! Yubikiri shiyo! = Let’s make a promise with pinkie? =Um…(if I break my promise, I need to swallow) one thousand needles, huh? Yes, it’s about cutting fingers. Are you scared? I am! 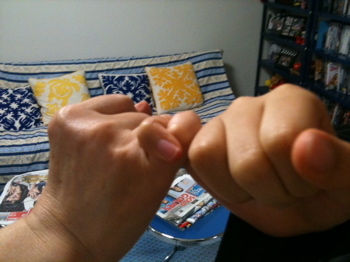 It is a gesture to make a promise or to swear to keep one’s words by interlocking one’s pinkies. = Jaa yubikiri shiyou! ? /Yubikirine! OK, then let’s make a promise and swear with pinkies. = Yubikiri genman uso tsuitara hari senbon nomasu. = Yubikiri genman ( = Cutting fingers- punching with fists 10,000 times), if you lie, I will make you swallow (drink) one thousand needles. = Have cut a finger! !kirakira! Cultural Note : This is a traditional children song that everybody in Japan knows. But it is said that the origin of 指切り ( = yubikiri) goes back to 江戸時代 ( = Edo jidai), Edo Period. Some 遊女( = yuujo) prostitutes in 遊郭 ( = yuukaku) the red-light district cut off the tip of their pinkie and gave it away to their important customer to show their loyalty and love. = Maggie chan watashitachi wa zutto otomodachi dayo. = Maggie, we are going to be friends forever! = Yes, then let’s make a promise. = Yubikiri genman, uso tsuitara…. = Otōsan doushite yūenchi ni tsurete itte kurenai no? Yakusoku shitajanai! = Dad, how come you don’t take me to the amusement park? We promised! = Kare wa itsumo yakusoku wo mamoranai. = He always fails to keep his promise. = Kyō wa tomodachi to ranchi no yakusoku ga aru. = I have a lunch date with my friend. = Rokuji ni chotto yakusoku ga arukara mou ikanaito. = I have some plans at 6 o’clock so I gotta go. = Minna mainichi kono burogu ni kite ne. Yakusoku dayo! = Come to this blog every day! We promise, OK? THANK YOU SO MUCH FOR THESE LESSONS! AS ALWAYS, THEY ARE WONDERFUL :)! Oh Thank YOU for visiting the site and leaving the nice comment!! What’s the word for “Favor” in japanese? naruhodo ne. itsumo aritgou Maggie sensei. Hi! Thank you for visiting this lesson. All the lessons are created by Yukari. Maggie is Victor’s dog. she wants to help me but she only has paws so it is hard to type. But she gave me a great inspiration. Victor has been helping me promote and proofread the lessons. He is great! 久しすぎたね、先生：) This lesson was great, I haven’t had the time I used to—I’ve been lurking though：）The part about the prostitutes was funny in a strange way. I love learning about the etymology of words and expressions. 久しぶり!! 元気だった? Hope you come here more often! Thanks for an awesome lesson! This site is really great!! Thank you for your nice comment!!! Hope you come back! But I will stick around for sure. PS: I like to colors of the website, very balanced, you designed it yourself Victor ? Hi Mari! Thank you for visiting this site! Victor has been helping me a lot to promote this blog but actually Maggie and Yukari are making lessons and Depointless designed the website for us. I am always waiting your visit here! THANK YOU for another wonderful lesson!!! I know…it was scary and disgusting but when we do or say 指切り, we almost NEVER think about the origin of the word or we don’t even know how it started. It is just a cute way to make a promise. You are the ideal visitor of this site! But do come back!